Creepy Uncle Joe is almost there. 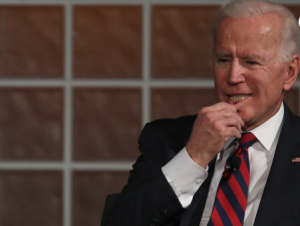 Joe Biden briefly, and accidently, announced he’s running for president during a speech in Dover, Del., on Saturday night — but then quickly walked it back. “I have the most progressive record of anybody running for the United . . .” the former vice president began saying, before stopping himself. He quickly clarified that he had not joined the crowded field of Democratic candidates just yet. “Of anybody who would run,” he corrected himself.